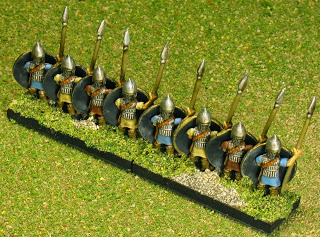 In preparation for the Assyrian campaign event at Fall-In 2012, JM and I ordered Neo-Assyrian Later Sargonid armies from Magister Militum. JM planned to paint his for the campaign event, and I’d paint mine so we could build a BBDBA army out of them. Yeah, that was a year ago. 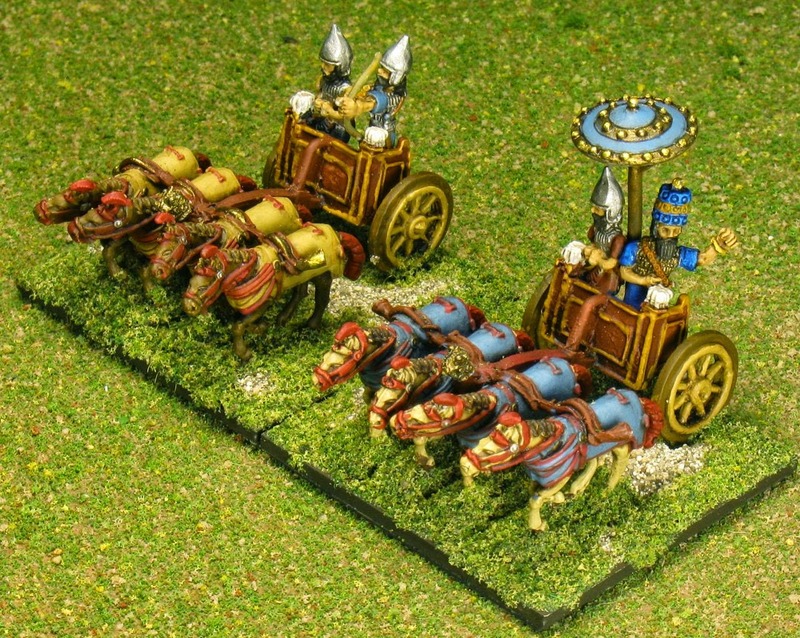 Assyrian Chariots; Magister Militum miniatures. As with many plans, this one failed to survive contact with the enemy. 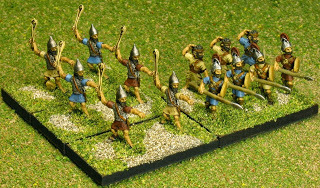 JM didn’t go to Fall-In, and I didn’t have an occasion to paint the Assyrians for BBDBA until this year. I planned to go to Fall-In 2013 with Mike Kaizar (there’s that “plan” thing again), and wanted to play Assyrians in Big Battles. 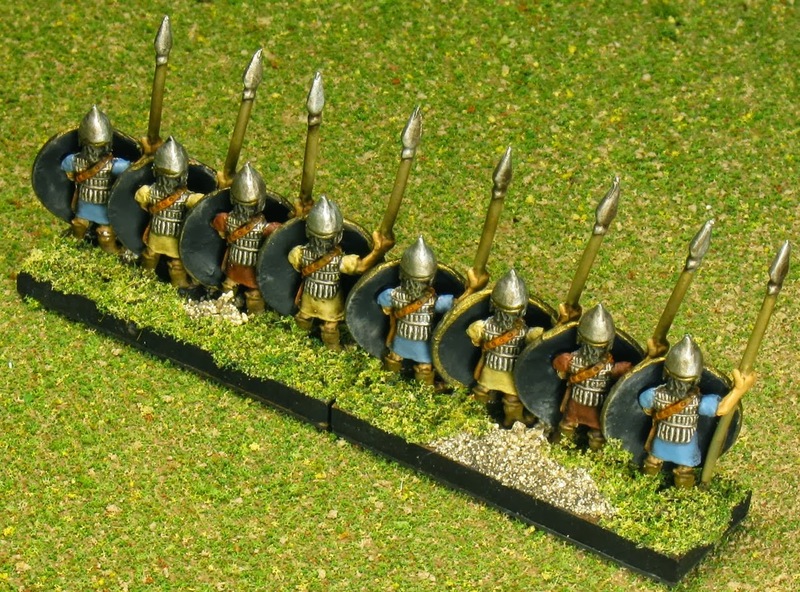 I got as far as painting this army in September before Mike cancelled, and I found another Big Battle partner who already has Assyrians painted. 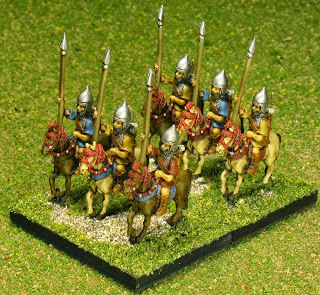 Assyrian Spearmen; Magister Militum miniatures. I didn’t do much research for color selections with this army. Essentially, I had a vague memory of seeing Assyrians in light blue-grey and red, and did that. The army painted up fairly quickly due to the few number of colors used, and I’m happy with the way they turned out. Biblical armies are my “dump stat,” so I don’t usually spend much time on them despite tending to enjoy the fast pace of Biblical battles. Luckily it’s often fairly easy to get a good look for them since they typically have simple clothing. I like the Magister Militum figures. 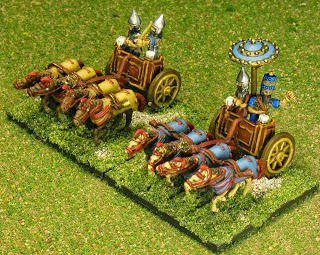 I believe these were originally Chariot miniatures before Magister Militum purchased the line. They’re sculpted well, and have a “toy soldier” feel, with very limited and static poses. The overall effect is good, though it has a bit of a “retro” feel compared to more modern figures. The figures they provided for the Horde elements are interesting. They sent an even mix of archers and lightly armed spearmen. 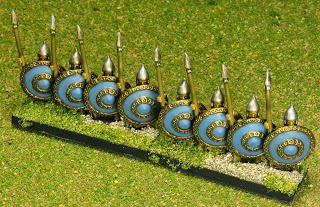 I decided to base them up similarly to Pavisers, since it doesn’t make much sense to put the spearmen behind the bows. 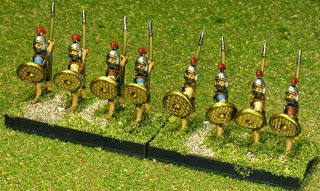 Assyrian Auxilia; Magister Militum miniatures. Assyrian Cavalry; Magister Militum miniatures. Assyrian Psiloi and Horde; Magister Militum miniature. Have been trying to work out themake of some figures I'd picked up 2nd hand, and your post has shown me – they're MM/Chariot figures. 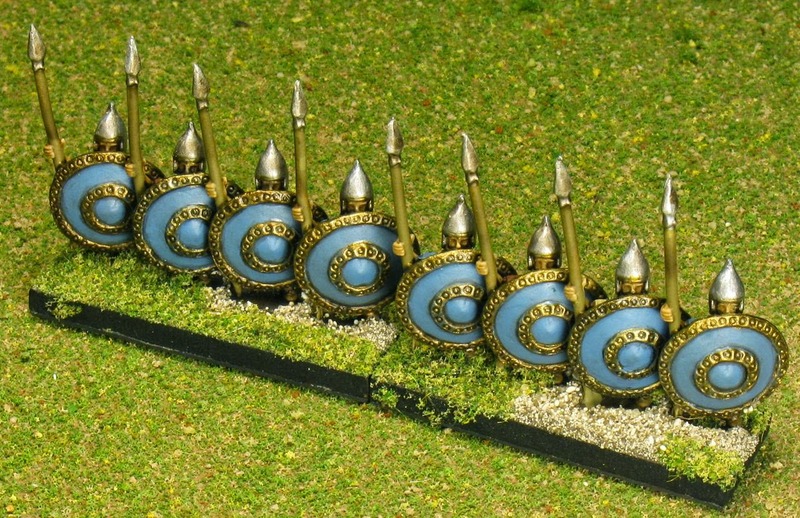 Might also get some inspiration from your paint job, as it's a lovely looking army you have there.